In need of a good animated treat? Swing of Change is exactly what you need then, something that won’t disappear on you even after the credits end. This 3D animated short was originally a graduation project for ESMA (école supérieure des metiers artistique, in Montpellier, France) by Harmony Bouchard, Andy Le Cocq, Joakim Riedinger and Raphael Cenzi, but has since then turned into a masterpiece already seen by thousands. 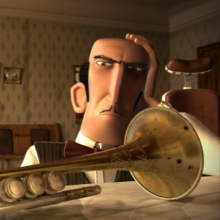 Set in New York during the 1930s, Swing of Change revolves around a racist barber who discovers quite an unusual trumpet. And it is this magical instrument that eventually leads the man to an unexpected change of heart and opening his business door to all, no matter of race. The film tells us that sometimes we have to open our mind and accept change for the better. I admire how the creators attended to the story line. You would definitely see that it’s well-thought of. The characters are heartwarming and they progress along with the story. The visuals are simply stunning and more than just a treat to the eye. It could be said that the execution is surgically precise and will, at some point, make you wonder if this is a mainstream animation. From the shaved hair to the ticking clock to the characters, the creators have surpassed quality and beauty with flying colors. Swing of Change brims with imagination. It’s an exquisite work of animated art that perfectly mixes a compelling story with satisfying visuals. I loved this one! The ending just forces a smile on your face!